People ask, “Why should I come to your school?”. The reason is that Grandmaster Li Tai Liang is headquartered here and he personally teaches 9 classes a week. Each student gets hands on instruction and corrections from the Grandmaster himself. The Xinyi-Dao System is an internal martial arts system that is used for self-defense. Students learn to use the elements of Shaolin, Tai Chi, Bagua and Xinyi style martial arts, to defend themselves against injury, disease, stress, the ailments of old age, as well as the more traditional meaning of defense against attack from other people. Our school values traditional ideas of respect, support and loyalty. 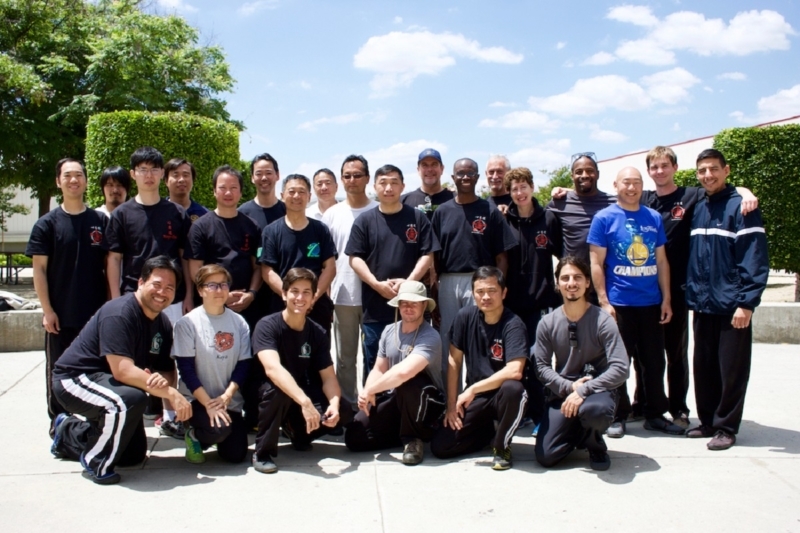 Grandmaster Li and each of his students strive to help others in their quest for better physical strength, internal power, mental focus, confidence, and discipline, as well as stronger friendships, community connections and a longer, healthier life. Registration in our school is flexible to suit all schedules . We offer small blocks of classes so you never need to sign long term contracts. Ask about our family discounts and our trial class. For more information, please contact Nancy Fiano at 631-357-0459 or email us at info@xinyidaousa.com. Class Schedule | Sign Up For A Free Trial Class! Xinyi-Dao New York City location is taught by Shifu Mark Li, son of Grandmaster Li Tai Liang and first generation inheritor of the Xinyi-Dao system. Our branch offers children and adults classes. For children’s class, we help students to develop physical strength, coordination, reflex, a respectful character, and a positive attitude. For adults class, students learn to develop a strong martial structure, whole body power driven by the core engine (Dantian), efficiency in striking, and awareness to the subtle internal body movement. For more information, please contact Shifu Mark Li at 347-822-3422 or by email at info@xinyidaousa.com. San Francisco Bay Xinyidao focuses on the teaching and cultivation of dantian spirals in all movements. Beginners are taught a variety of standing postures to develop connectivity. Then, a simple version of squatting monkey is used to demonstrate and practice storing and releasing in a straight vertical line. Stepping methods are introduced to show how dantian rotation can be used to power forward movement. Through the various forms and techniques of Dai style Xinyiquan and Che style Xingyiquan, we explore dantian powered movement and technique. We also work on Cheng style Bagua circle walking and palm changes to provide further emphasis on twisting and spiraling. The evasive techniques emphasized in that art are also explored. Our two person practices follow the same progression from simple to complex, starting with fixed two person drills and forms, and gradually working into applications against progressive resistance. Our basic philosophy is to progress from simple to complex, working on both the internal connections and external forms alternately. Students are expected to do solo training outside of class, so that group sessions can focus on teaching of new material, correction of old material, and two person practices. Our goal is to teach achievable skills that will help the practitioner in both martial and health contexts. For more information, please visit their Meetup.com page or call Shifu Alvin Chew at xinyidao@yahoo.com. Seattle Xinyi-Dao practice group is dedicated to the study of Xinyi-Dao. We focus on fundamental skills and 2 person partner work. Shifu Frank Wong, the founder of the practice group, has studied Xingyi Quan, Xinyi Quan, Bagua Zhang, Shaolin Kung Fu, Chen Style Taiji Quan, and Yang Style Taiji Quan for more than 30 years. He has been a student of Grandmaster Li Tai Liang since 1999. Beginning students are instructed by senior students with more than 10 years experience in Xinyi-Dao. The group meets weekly on Saturday in various parks in Seattle, Washington. For more information, please visit their Meetup page or email Shifu Frank Wong at seattlexinyidao@gmail.com. We are a group of like interest dedicated to the research of our Scholar Warrior Arts system consisting of Xinyi-Dao, as taught by Professor Li Tailiang & Master Yang Fansheng, Tongbei Wuyi, with comprehensive study in complementary skills such as Sanda Concepts & Beijing & Shanxi style Shuai Jiao (Chinese /Mongolian Wrestling). This study group is lead by Coach Sudan Jeffers, disciple of Professor Li Tai Liang. In 2011 Coach Sudan was a U.S. Lt Heavyweight Shuaijiao National Champion. Assistant Coach Barbara Gitlitz also provides further tutoring. Shifu Sudan Jeffers has trained extensively in Taigu County Shanxi Province, the birthplace and epicenter of Xingyi Quan, as well as other styles in Dongbei, Cangzhou Hebei, and Chongqing. Just good folks, good gongfu, and good times. Our schedule consists of both group sessions and one on one corrective practice. So those interested please correspond with us prior for schedule of open classes. For more information, please visit their Facebook page or email Shifu Sudan Jeffers at CoachSudan@juno.com. Classes taught by Grandmaster Li Tai Liang’s disciple Shifu Dan Regan. Dan ’s classes focus on practical application along with building a solid foundation in the unique Xinyi-Dao body mechanics. We are a semi private group of working adults whom share the same goals of learning the depth of Xinyi-Dao, building great friendships and pushing each other to be the best we can in training and in life. We train hard but smart, avoiding injuries whenever possible and always putting respect for our training partner first. We leave our egos at the door and show up for class with an empty cup and an open mind as we all learn from one another in each and every class. Dan trained extensively with Grandmaster Li in NY since the year 2000 and became a disciple in 2003. Dan taught various Martial Arts classes on Long Island, and Brooklyn NY since the late 1990’s before relocating to the West Coast in 2009. He teaches private lessons and group classes in Los Angeles California in the Canejo Valley and also private lessons in Hollywood, Glendale and Burbank. Along with his extensive training in Xinyi-Dao, Dan is a Full Instructor in Bruce Lee’s Jun Fan Jeet Kune Do/MMA, Wing Chun, Kali/ Eskrima , Mande Muda/Sunda Silat and Grappling. Dan is also a Licensed Acupuncturist and Herbalist having received his Master Degree in Acupuncture in 2004 and a second Masters in Herbal Medicine in 2006. Dan is considered a cross training expert and has taught Police, Bodyguards, Military, Celebrities, Stunt Men, and working professionals from all walks of life. With all Dan’s experience in various Martial Arts methods he feels Xinyi-Dao is one of the most complete systems you can find and he is looking forward to sharing the practical self defense and healing side of this great method of Chinese Gong Fu. Whether you are looking to enhance your current training or are a beginner looking to start your journey in Martial Arts you can contact Dan through his website at www.Regansmartialarts.com.